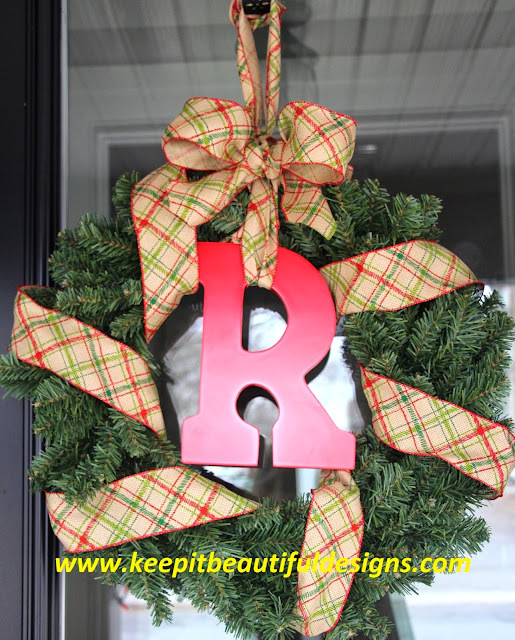 Keep it Beautiful Designs: Fabulous Friday: Christmas Monogram Wreath DIY! 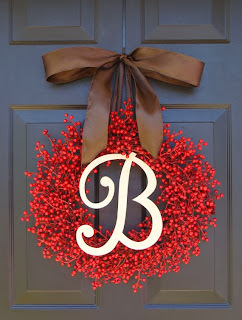 Do you feel like it's early to haul out your holiday bins and turn on the Christmas lights? If you've been in any mall since November 1st you'll see that Christmas is upon us!! I'm really starting to feel the Christmas spirit and like retail, the blogging world has been talking Christmas since the summer. Yup! 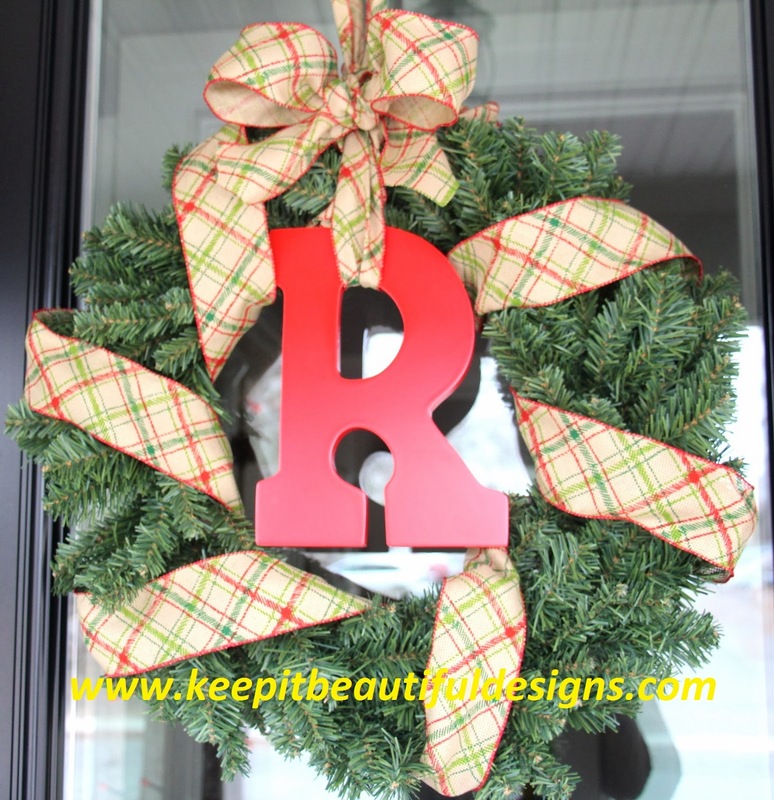 So, to kick start my holiday décor I wanted to make up an oh-so-fabulous wreath. I wouldn't say I'm a true crafter. Actually, I know I'm not. My Aunt Barb can whip up the most gorgeous blanket or sew a teddy bear in her sleep. I love a good challenging DIY but enjoy a relatively simple craft. 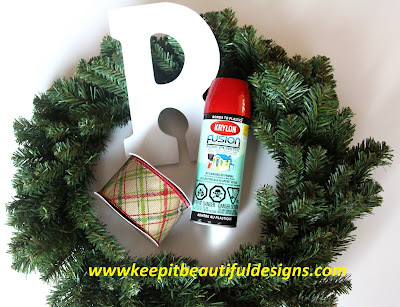 So if you are looking for a wreath that requires little materials, little detail, little time and a whole lot of fabulous...this Christmas wreath is for you!! 1. Loosely, wrap your ribbon around your wreath. How simple was that? 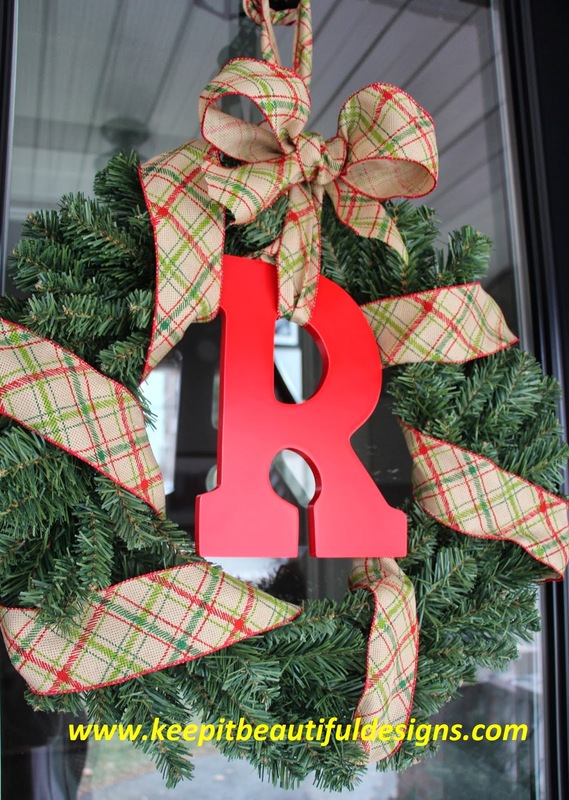 Normally, I go with a little bling on the door (check out last year's) but this year this traditional style ribbon said "take me home". 2. Spray both sides of your letter. I went with Christmas red. 3. 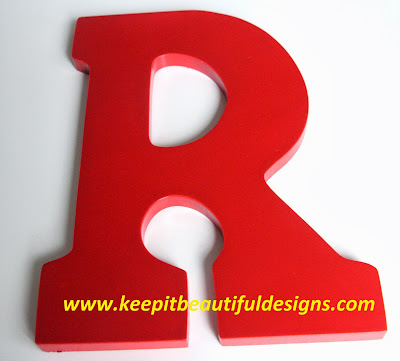 Once my letter was dry I just took a piece of my ribbon and wrapped it around the top part of the "R". 4. 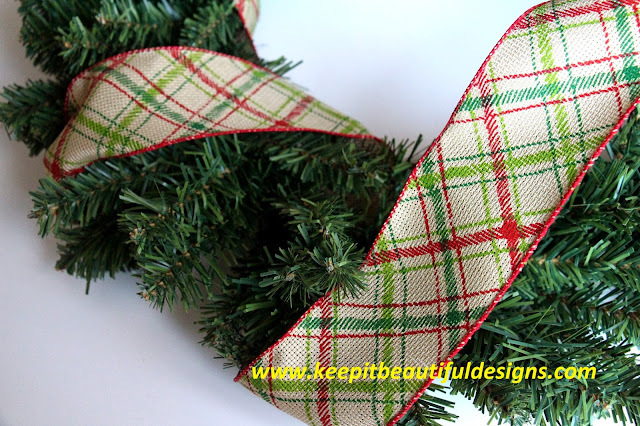 I then tied the ribbon in a knot to the wreath. If, for example, your letter was a "M"...you could either wrap a piece of ribbon to the two top points of the "M" and then attach to the wreath or you could hot glue gun the ribbon to the back of the top points and then tie around the wreath. 5. Now for the bow to hide your knots. Okay, so this is where my crafting abilities fail me. If you are fabulous at bows then this is where you could have a beauty bow with loop-da-loops. I literally used my shoe-tying skills ;) and tied a traditional bow. How do you tie that bow on? If you have wire, go ahead and use it. Or, I just cut a tiny piece of ribbon and tied the bow to the wreath. That's it! 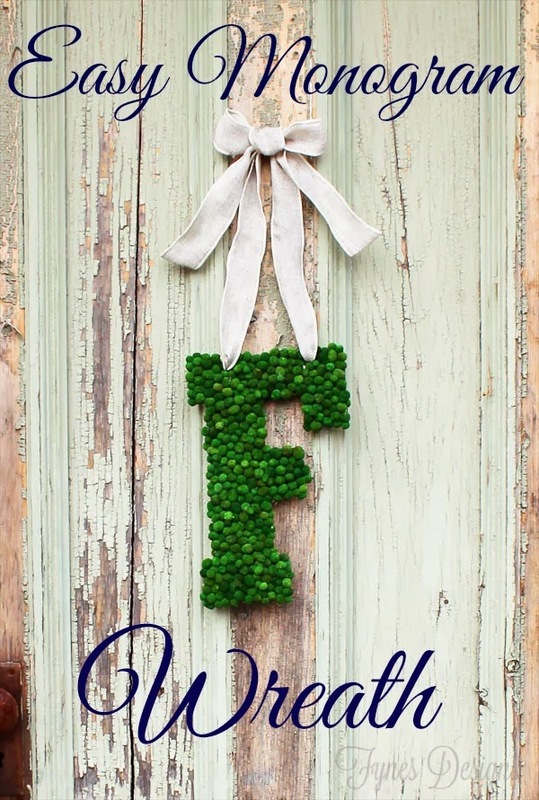 With only a few materials, no sew and no glue if you don't want to use it...you can have a fresh.fabulous.sophisticated monogrammed holiday wreath! Have a great weekend! 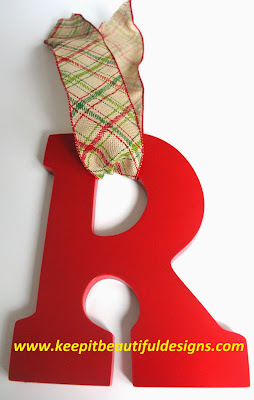 Next week I'll have a fun Advent Calendar idea for you, maybe some holiday mantle love and don't forget to add your comments to my post on the Tegu Blocks for a chance to win them! 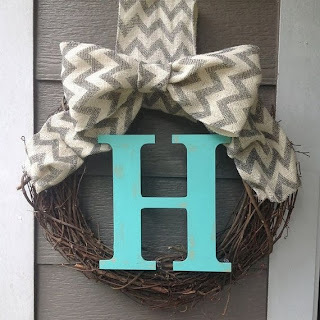 That is my kind of DIY too ;) I'm a sucker for monograms. Nice work! Such great wreath ideas. 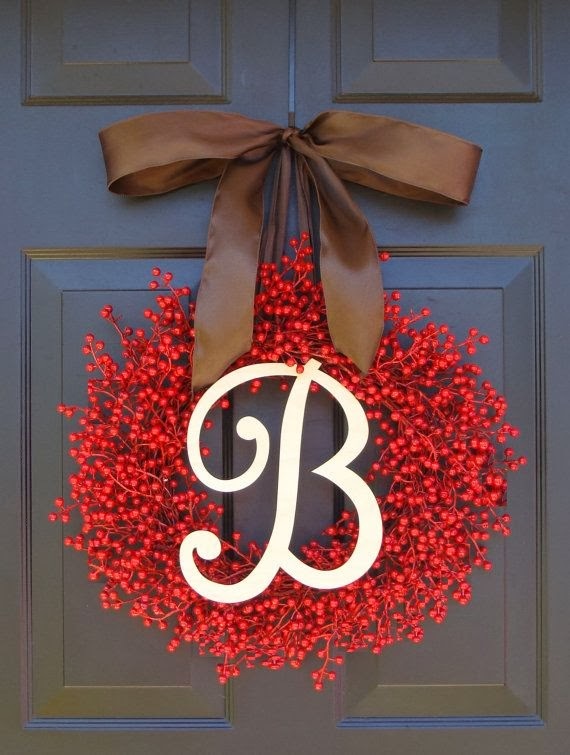 I love having some kind of front door decoration on our door all year long. I don't have a Christmas one up yet though. I have to get on it. Thanks for the inspiration. Easy and elegant. Love it! 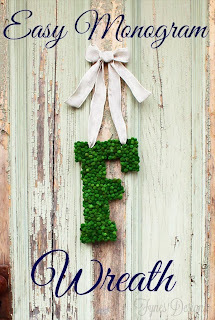 Sometimes the simplest crafts are the best - love it! This is so cute and clever. I love monogram wreaths and yours turned out great!